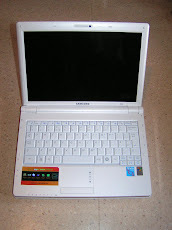 You will find on this blog all the steps I followed in order to make my new netbook, a NC20 by Samsung (the UK version), work with gentoo. Feel free to post any comment you have. My system is working, let's play with it. First: the framebuffer. Configure your kernel to hoave both uvesafb and viafb built in the kernel. Along with that, I discovered that the theme natural_gentoo had also a grub splash screen. To install it, go to the fbsplash website and download the archive for natural_gentoo. You will find a gentoo.xpm.gz file. Copy it in /boot/grub/ and change/add this line to your grub.conf: splashimage=(hd0,X)/grub/gentoo.xpm.gz. Now your have a new theme for your grub! I'm back after some hard working on my netbook. I will not speak about things which worked just fine, but only about my issues. Then during the kernel configuration, don't forget like me to select the PATA drivers for the Via chipset. It took half an hour to compile with the NC20. After that I was able to boot under my new Gentoo. The next step is to recompile system tools. An "emerge -e world" will do it. Now that I have made some place on the HDD, I can (finally) begin to install Gentoo. Unfortunately, the filesystem I have chosen is ext4, which is included in the 2.6.28 and above kernels, is not supported by any gentoo live cds (I have only seen 2.6.27 kernels). Nevertheless I found out that the beta of the next Ubuntu release uses a 2.6.28 kernel, so I created a live USB (with unetbootin) to boot with. New issue : X doesn't work with the NC20 on this particular live Ubuntu, so I switched to a VT (Ctrl+Alt+F1), and continued the installation as explained in the Gentoo Handbook. I wanted to use the distribution Parted Magic to have something user friendly to resize my Windows XP partition. Unfortunately, the live USB I created didn't worked, so I used a Gentoo Minimal Live USB to resize. Before explaining how I resized the NTFS partition, let's see how to create a live USB. The process is really simple : under a gentoo box, emerge netbootin, and execute it. Aside from that, download the ISO image you want to place on your USB key, and mount your key (usually, WMs like Gnome or KDE mount it automatically). Now you have all the elements to create your Live USB key with netbootin. After booting the key on your NC20 (F2 to enter BIOS setup and change boot order), you will have your live linux. You can now reboot to unsure windows is still operationnal (it will check the ntfs partition, so let it do it, it's needed after ntfsresize). Here I am : I have a 160Gb HDD with 16Gb for Windows, and plenty of room for Gentoo !! First step was to boot it under Windows to see if rebooting works (3 reboots before even starting to do anything). I will keep a copy of windows in case of I have a course on a software only available under this OS. Do not be afraid though, I will only speak one more time about it to explain how I redimensioned its partition (that will be my next post). So, now my first impressions. Its color (white pearl) is wonderful, let's see if the plastic will be same after a year or two of intensive use. Keys are of the size of a normal keyboard, definitely a good thing. Finally the 6 cells battery merely goes out of the hull. Oh, I almost forgot, the pocket shipped with the netbook is nice even if it really is thin. Next step : make some place on the HDD to install Gentoo !